For more examples of books that would fit, please take a look at the Fairy Tale Fiction Reading List at Endicott Studio. They also have some non-fiction suggestions at the end. And there are also lots of examples to be found at the SurLaLune Fairy Tales website. Just pick any of the annotated fairy tales and then click Modern Interpretations (for example: Hansel & Gretel). But it's not just reviews I'm looking for. You could write a post about childhood memories of reading fairy tales (or adulthood memories of reading them to your children, or simply of reading them yourself). You could write about why you like fairy tales (or why you don't). You could pick a favourite fairy tale and write about what it means to you. Or whatever else you can think of. Nothing would make me happier than an original approach to the theme. Remember: variety is good. And let's not forget fairy tale illustrators. If someone were to submit a post about their favourite fairy tale illustrator, modern or classic, I would be seriously inclined to buy them dinner at a really nice place. Or send them chocolate. Not that I'm trying to bribe you. Don't forget that the post doesn't have to be written specifically for the carnival. You can submit old posts. The carnival will most likely bring new readers to your blog, and for them the post will be new. Well, I think that's it. When I receive your submission, I'll write back confirming that I got it, and once the Carnival is up I'll e-mail everyone letting them know. Please contact me if you have any questions. I'm really looking forward to reading all your submissions! PS: Plus, you can win books! Find out how here. I was actually thinking today that I should write something about my favourite faerytales/legends illustrator, P.J. Lynch. so I think I'll do that for the carnival! Anyway, I am so looking forward to this edition of the carnival!!! Melody: I'm so glad you're participating :) Do send along any other posts you find. Madeleine: I'm glad you're interested in participating, and I look forward to your submission! Your Book Carnival sounds like great fun, I can't wait! You've done a great job renovating your archive, I'm glad you found an (apparently) easy solution. Oh yeah!! I'm reading White as Snow by Tanith Lee right now. A perfect submission!! This is going to be a fun carnival! Yay! My first carnival that I will be submitting some reviews! And to think that I never really thought I was a reader of fairy tales. Eeeks--I am so behind in my blogging, so I'm trying to catch up quickly. Would Wicked count?? I've never participated in this before, but if it counts as a fairy tale (twisted as it is), I'd love to submit. If not, I'll see what else I can find. Stephanie: Perfect indeed! Can't wait to read your post. I would like to submit a few posts. I recently wrote about Tuck Everlasting, The Goose Girl and soon to be published review of The Book of Lost Things. I will e-mail them to you for review! Thanks for hosting! 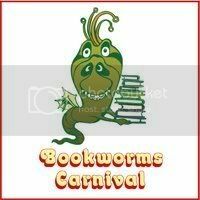 I'm new to Bookworms Carnival, so I'm sorry if this is a silly question: If I want to submit something, do I go ahead and make a post on my blog and send you the link, or do I submit the content to you and make the post if you accept it? I'm just not quite sure how this works. Lenneth: It's not a silly question - you're not the first to ask, actually, so I apologize for not having been more clear. You make the post on your blog and then e-mail me the link. Then on the main Carnival post I post little blurbs about each submission and the link to the rest of the post. I've never participated before, but there's a first time for everything, right? And fairytales ... oh, so many to choose from! Maree, yes, there is always a first time :) I look forward to your submission. This was such a great idea for a topic! I just sent a couple of submissions and I'm looking forward to seeing so much stuff about fairy tales! I can't wait to read all the yummy post for this Carnival!